Posted in Cookies, Desserts, on June 30th, 2015. Can I just tell you that you have to make these and leave it at that? No, you probably won’t believe me, will you? I don’t use that kind of forceful declaration very often. Well, just believe me, okay? Often I’m led down a cooking path by the description of a recipe. Maybe it’s something unusual about it – or in it – that piques my interest. Other times it’s because there’s such an interesting background story about it. Or maybe it’s a homegrown recipe from way back. In this case, it’s Molly Wizenberg, of Orangette blog, cookbook fame, and her husband’s restaurant Delancey fame too. I’ve always admired Molly’s writing – she has a gift of building up a great story and I was following her long before she became famous. I read her blog and liked it. This recipe came from her column in Saveur. And I got hooked on it because of the story. She and her family were on a drive in Washington, and her daughter was hungry. So was everyone in the car and most of the stores were closed in Edison. They found Breadfarm was about to close – they grabbed some things and dived into the bags as they stood in the parking lot. What emanated from them all were ooohs and aaahs. 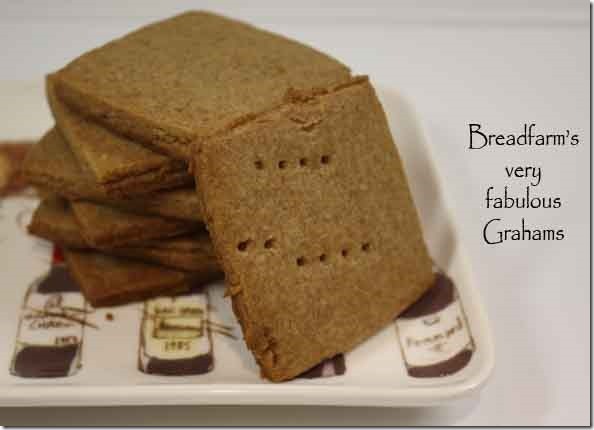 But it was the little package of freshly baked graham crackers that made the biggest impression. They were gone before she arrived home. And, because you’re Molly Wizenberg, you obviously can pick up the phone and tell the people at Breadfarm that you want to feature them and their recipe in an article in Saveur. I’m ever so glad she did. Normally I’d probably not make home made graham crackers. Crackers, in general, are a lot of work, and one meal, usually, and they’re gone. But Molly just made this graham cracker/cookie sound so divine that there just wasn’t anything to do but make these. First, however, I had to go shopping. I don’t stock whole wheat flour much – it turns rancid so quickly (the remainder is in the freezer for now). And I certainly had never used whole wheat pastry flour. Had to go to two stores before I found those items. It also uses wheat bran – another thing I don’t keep on hand because it doesn’t keep all that long, either. Fortunately I read and re-read the recipe before I began to make them. 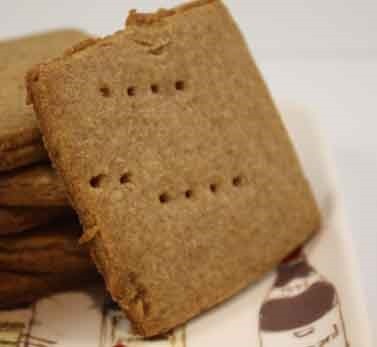 Making these requires several visits to the freezer as the precious little graham cracker cargo are chilled and slightly frozen before baking. I was home anyway, so I was certain to make these at a time when I would have no distractions. My kitchen freezer is very full. (Actually, this is a mini form of hoarding, I think – I can’t seem to ever get my freezer to some manageable amount of fullness – it’s always chock full.) So I had to slide the cookie sheets with the rolled out cookies/crackers on parchment into my garage freezer (yes, there is room there). It required 2 visits to the freezer, and technically they were supposed to have a 3rd visit, but I did a shortcut on that one. The batter is easy enough to make – you cream the butter, sugar (she calls for cane sugar, I used moscovado) and honey for awhile, then add the dry ingredients in 3 separate additions and continue mixing until it pulls away from the workbowl using the stand mixer. The batter is divided in half and pressed into a 1-inch thick rectangle on parchment. A 2nd piece of parchment goes on top and a rolling pin is used to squeeze down the dough to 1/8 inch thickness. The recipe says to keep the dough in its rectangular shape. Well, I couldn’t do that – I was handling it too much, so I just lived with the results of an oval shape and re-rolled the scraps. 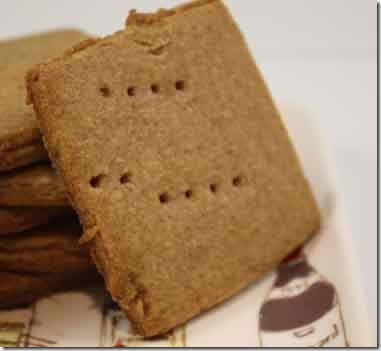 Some time was spent in the freezer, then you poke the crackers with a fork and either perforate the dough into squares, or in my case, I used a square cookie cutter, which worked just fine. Back into the freezer they go, so they’re cold-cold before you bake them. They are separated and placed on a parchment-lined baking sheet. And they’re baked. And I remind you – you have to make these. They’re just SO good. They’d be loverly with cheese as an after-dinner course. I’m serving them with my lemon velvet gelato on Father’s Day – this won’t post until a week or so later. What’s GOOD: the taste. Oh my yes, they taste wonderful. And although you will have spent more time than usual making a batch of these, you’ll be glad you did, if you can make the time to do it. They make a very nice snack, or a straight-out cookie. And maybe you’ll think it’s not so bad because it’s almost all whole wheat flours. What’s NOT: nothing whatsoever is bad about the cookie/cracker. It just takes a bit of time to make. And they’re a little bit fussy – trying to get the dough flat and square as you roll it out – you don’t want them to be thicker on one side than the other, not only would they not bake evenly, but they’d look funny. 1. In a medium bowl, whisk the flours with the wheat bran, baking soda, salt, and cinnamon. 2. In the bowl of a stand mixer fitted with the paddle attachment, beat the butter, sugar, and honey on medium speed, stopping occasionally to scrape down the sides of the bowl, until the mixture is creamy, 2 minutes. With the mixer on low speed, add the dry ingredients in three batches, stopping as needed to scrape down the bowl, until the flour is fully incorporated. 3. Continue beating until the dough comes together around the paddle, pulling away from the sides of the bowl. 4. Scrape the dough out onto a work surface and gather into a ball. Halve the dough ball and place each half on a 12” x 16” sheet of parchment paper. Pat each half into a 1”-thick rectangle and then cover with another sheet of parchment paper, lining it up with the first. Using a rolling pin, roll each dough half between the sheets of parchment to an even thickness of 1/8”, maintaining its rectangular shape [this was very difficult to do, so I made do with a big oval shape]. Carefully transfer the two dough halves, still between the parchment sheets, onto two baking sheets and freeze for 30 minutes. 5. Remove each sheet from the freezer, and transfer the parchment-wrapped dough sheets to a clean work surface. Remove the top sheet of parchment from each, and working quickly, use a fork or skewer to prick the dough sheets at roughly 1-inch intervals. Using a pizza cutter or a sharp knife, score the dough into 2-inch squares. Trim the scraps, and reserve to use for re-rolling and making more cookies. Return the pricked and scored dough sheets, still in single, large sheets, to the freezer for 15 to 20 minutes, until very firm. 6. Position racks in the upper and lower thirds of the oven, and heat to 350°. Remove the chilled dough sheets from the freezer, and invert each onto a clean work surface. 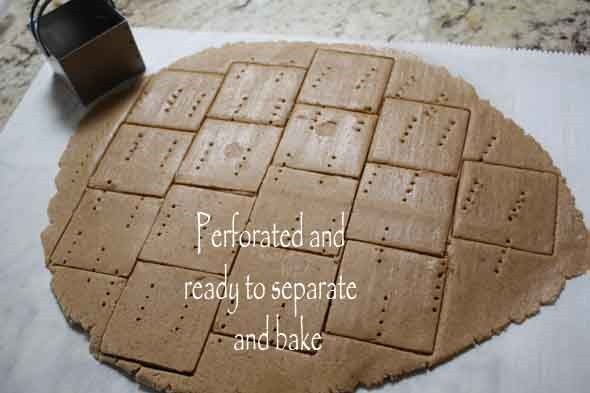 Peel away and discard the parchment paper and, working quickly, separate the dough sheets along the score lines, into individual squares. Place the squares onto three parchment paper-lined baking sheets, spacing them about 1 1/2 inches apart. Chill the squares on the baking sheets for 15 minutes. Per Serving: 69 Calories; 4g Fat (49.7% calories from fat); 1g Protein; 8g Carbohydrate; 1g Dietary Fiber; 10mg Cholesterol; 46mg Sodium. These caught my eye, too, and have been lurking in the far corners of my brain since I saw the article. They were in danger of getting lost, so I’m glad you brought them up. I was a bit shocked at the price–$10 for a little bag of graham crackers in the photo with the article (looks like maybe 20 squares max). The fact that they are labor intensive as well as being a high quality artisan product no doubt accounts for that, but it’s still more than I could justify paying. I’m glad to know they are worth the trouble to make them yourself. Thanks for the reminder!